If, like me, you’ve ever bought one (or two, or three) baby monitors that really didn’t work very well, you might be wondering whether there really is anything better out there. Oh, my friends, there is.The Oricom SC 910. Get this one, you’ll never need another ever again. To be frank, I’ve had a bit of a love/hate relationship with baby monitors in my time as a parent. Honestly, with some I’ve tried, I would have had more luck with two tin cans tied to a length of string. Everything interfered with them, and most of the time I just picked up a kind of static white noise (“Is he crying? I don’t know – does that sound like crying to you?”). If I was lucky, I sometimes tuned in on interesting conversations my neighbours were having, but that wasn’t really why I bought the monitor in the first place. I would have loved a baby monitor like this one. The Oricom Secure 910 is a digital video monitor. The basic pack comes with a camera unit and parent unit (the one with the screen), so that as well as hearing what’s going on, you can keep an eye on it too. Have you ever accidentally interrupted your child’s nap because you thought they had woken up? With a monitor like this one, there’s no chance of that kind of mishap ruining nap time. Digital technology in the SC910 means the video and audio on the 17cm screen remains clear even over long distances, and the infra red camera will be better at seeing in the dark than you. You can even tilt and pan out with the camera, controlling it from the screen unit! What’s more, the parent unit can monitor and display up to four cameras at once, using a split screen function – so if you have a lot of little people to keep an eye on, you can do it all from the convenience of a single unit about as big as an iPad mini. 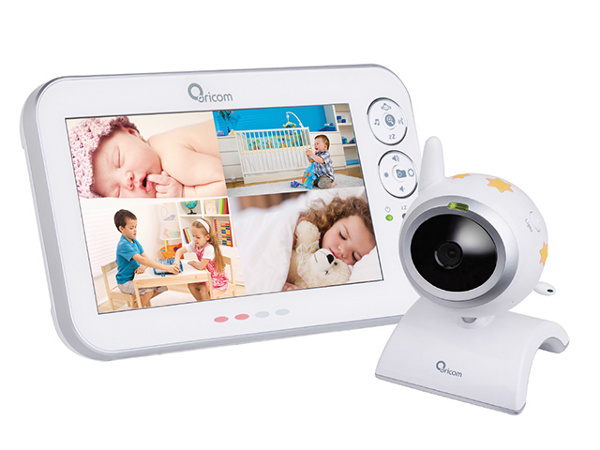 It’s no surprise that the SC910 just won the Gold Award at the 2014 My Child Excellence Awards in the baby monitor category. With a nightlight and a microphone function so that you can talk through the unit to your child, the SC910 even plays lullabies. In fact, it does just about everything except pick your little one up – you’ll still need to do that yourself! You can buy the Oricom SC910 for $329. Have a look for stockists near you.